Danosa has over four decades of knowledge and experience in building and construction materials, specifically acoustic insulation, waterproofing, drainage and geotextiles. 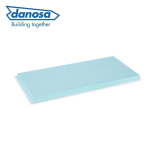 Here at Insulation Superstore we are proud to offer a selection of Danosa insulation boards at competitive prices. Danosa Danopren is a rigid extruded polystyrene (XPS) foam board, with shiplap edges. Manufactured without CFCs, HCFCs or HFCs, the boards have high compressive and mechanical strength, and have been designed to be robust to withstand rough handling, transport and installation easily without losing any physical integrity or its performance as a thermal insulator. Choose from a range of thicknesses, from TR30 which is 30mm thick, to TR100 which is 100mm thick, and all Danopren insulation boards come in 1.25m lengths. If you have any questions or queries about Danosa insulation boards, or want to know more before placing your order, give our friendly team a call on 01752 692206 and we’ll be happy to help.